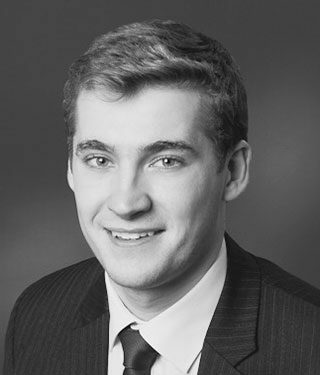 James joined chambers in July 2017 following the successful completion of his pupillage under the supervision of Matthew Farmer and Beresford Kennedy. James has been commended for his personable style; engaging in court and with clients alike, he translates complex legal matters into comprehensible advice. James accepts instructions across chambers’ practice areas with a particular emphasis on civil matters involving property, commercial disputes, and personal injury. During pupillage, James gained experience in civil, crime, family and immigration hearings, and has continued to expand his practice in civil and family law.. Before joining chambers, James worked as a county court advocate. He has since built on his extensive experience in the areas of landlord and tenant, mortgage repossessions, insolvency, contract, personal injury as well all manner of procedural hearings. James acts for landlords and tenants in possession claims, claims for recovery of service charges, and deposit protection disputes. James also advises and represents clients in other property matters including leasehold disputes, trespass, mortgage repossessions, boundary disputes and TOLATA claims. James is regularly instructed in the Small Claims Track, Fast Track and Multi-Track for road traffic accidents, credit hire and holiday sickness claims, which include advising on quantum and drafting pleadings. James has also acted on appeals in the county court under its appellate jurisdiction. Beyond property and personal injury matters, James has appeared in the County Court and High Court in insolvency and bankruptcy matters, and has a wealth of experience in general contract disputes, and issues of tortious liability. L v S Ltd (2018) – successfully appealed against a decision to refuse permission to substitute parties after expiry of limitation. The claim was wrongly issued against a previous employer and both the first instance application and appeal involved issues of employer’s liability, TUPE transfers, limitation and QOCS. S v Y-H (2018) – represented the claimant freeholders in a trial for recovery of ground rent and service charges. The claimants were awarded all of the sums claimed and recovered costs under the lease. SS v AP (2018) – defeated an application to set aside judgement and obtained a possession order for the lender on a mortgage of large commercial premises. G & Ors v K & Ors (2018) – acting for freeholders in a claim for injunctive relief and damages relating to interference with an easement by multiple neighbouring landowners. O v O (2018) – represented the claimant in a claim for recovery of loans between family members and successfully negotiated a full settlement at trial. A v L (2018) – represented the landlord in difficult section 8 possession claim and advised on how to remedy defects as well as service of a section 21 notice following the change in regulations. H v I (2018) – provided advice and drafted pleadings for a wrongful forfeiture claim seeking injunctive relief and damages. The dispute centred around a sub-lease for restaurant premises. EP Ltd v P – successfully represented the claimant in an application for an interim possession order over part of retail premises on which trespassers had taken up residence. M v T Ltd (2018) – acted for the claimant defending an application for a finding of fundamental dishonesty after discontinuance. H v H (2018) – acting for a joint owner responding to an application for an order for sale including a claim for occupation rent. S & T v N (2017) – provided advice and representation in relation to TOLATA issues in a dispute between joint owners of property previously the subject of an agreed order for sale. A v G (2017) – advised and represented a Landlord in a deposit protection dispute which centred around the definition of an assured shorthold tenancy and whether the rooms let to the claimant formed ‘part of a building’. A favourable settlement was negotiated part-way through the hearing. C v S (2017) – advised on a boundary dispute involving land purchased for development for which there were a variety of contradictory plans. B Ltd v M (2017) – advised a freeholder on multiple breaches of a covenant against alterations. L Ltd v C (2017) – advised and represented the owner of a ‘guesthouse’ offering long-term lets in a successful trespass claim after an occupier refused to vacate. James has experience across all areas of family law. James’ experience in property law makes him well-placed to advise on TOLATA disputes. He has acted for all parties in interim hearings in matrimonial disputes, and public and private children disputes. James also has experience of financial remedy final hearings, and has represented parents and the guardian at final hearings in both public and private law proceedings. He is available to act in applications for occupation and non-molestation orders. M v M (2018) – represented the guardian at a final hearing in private law proceedings involving a significant breakdown in the relationship between the children and mother. H v M & J (2018) – acted for a mother with significant cognitive difficulties in public law proceedings. S V S (2018) – representing the wife in financial remedy proceedings involving a large property comprised of several parts for both residential and commercial use. WB v Z (2018) – acted in public law proceedings involving a new-born child for a father with significant learning difficulties and who faced serious allegations of harming unrelated minors. H v N & B (2018) – acted for a mother in public law proceedings during which the local authority completely reversed its care plan without notice. H v E&B (2018) – acted for the father in public law proceedings involving a very young baby for which the care plan was adoption. James is a Grade 1 CPS panel advocate regularly instructed to prosecute and defend trials in the Magistrates’, Youth and Crown Courts. He has appeared in courts across London as well as on the South-Eastern, Western and Midlands circuits. James has received instructions on a range of offences including sexual offences, drugs offences, offences against the person, property offences, public disorder, and fraud. R v B & B (2018) – acted for a defendant on trial for conveying cocaine into prison. A v DPP (2017) – successful appeal against conviction where A was of good character and accused of obstructing police, conviction for which would potentially lead to a loss of employment. The appellant was acquitted on the basis there was no case to answer. R v S (2017) – obtained an acquittal for a defendant accused of benefit fraud. S was prosecuted for dishonestly failing to notify a change having received a £60,000 inheritance. HC v P (2017) – successfully represented the accused in a DVPO which would have caused his business to collapse. The complainant made allegations on video to the police but her evidence was dismantled in the hearing. R v B (2017) – successfully represented a youth accused of possessing an offensive weapon in a public place, including an application to exclude admissions.